We have work with businesses all over the country on web and graphic design projects, but it is especially rewarding working with businesses based in our local vicinity. Our newest client, Paper Shower, is located right here in Lincolnshire IL . 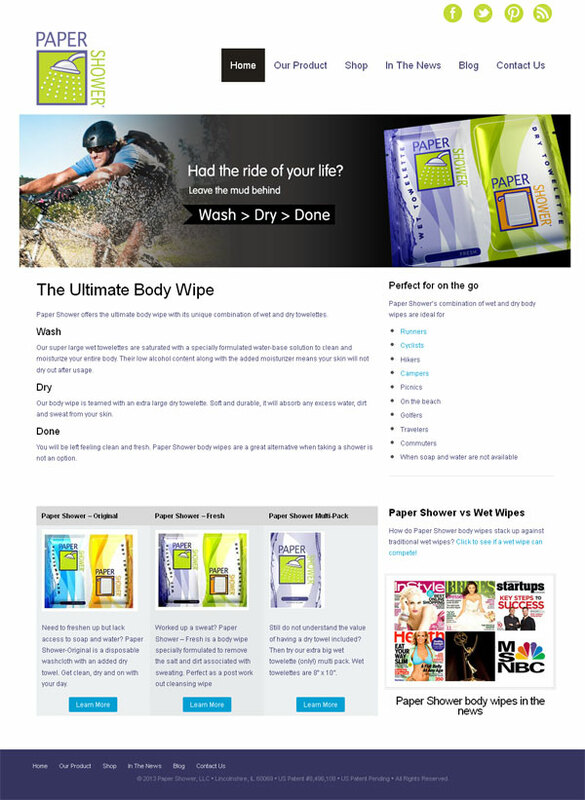 Paper Shower offers a range of unique body wipes which combine a large wet wipe with a dry towelette and are great for active people who are looking to freshen up on the go – bikers, runners, while camping, hiking and traveling or even on the golf course. There are several reasons for the need to redesign a web site and the old Paper Shower site fulfilled quite a few. Firstly the site was making the visitors work too hard to understand the product, it was only after clicking through from the home page that the concept of the product having both a wet and dry towelette became obvious. Secondly, almost no consideration had been made as to who the product was being marketed towards – it was too generic. Lastly the site was not at all optimized for the search engines, the home page itself was a collection of images and as a whole had very little keyword rich copy. Ranking in the search engines was poor and traffic was minimal despite great PR coverage the product has had over the last few years. Understanding the issues facing the old site helped us create a strategy for the re-design and re-launch of the new site. Any SEO project needs to kick off with a through understanding of the online competition. We took an in depth look at other body wipe websites and our analysis resulted in the compilation a list of favorable key phrases. We started with the creation of a set of web banners that incorporated the product and an outdoor scenario or an occasion where the product would be useful. Each banner also carried the phrase Wash > Dry > Done, which was elaborated on with keyword rich copy underneath which quickly and easily explained the product. The home page was updated to include more details of the product range and examples of who may find the product useful. We used video and client testimonials throughout the site for easily digestible communication. We are in the process of completing the internet marketing of the site but are confident that the re design and optimization will result in increased traffic and sales. 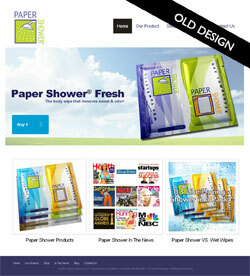 Read more about Paper Shower in our web design portfolio. 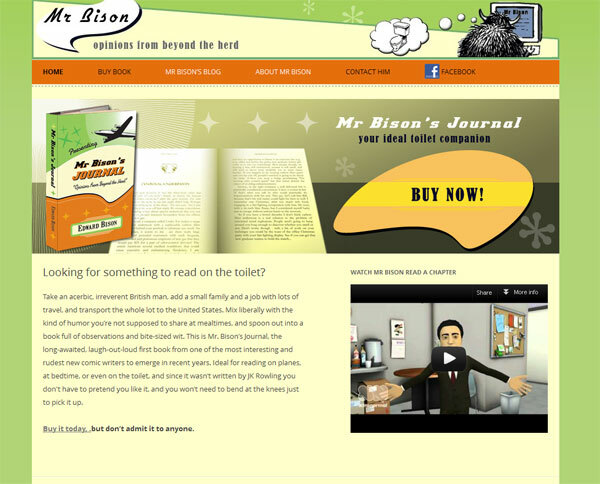 As part of the launch we updated his website www.mrbison.com moving it from a blogger powered blog, to the all singing and dancing WordPress platform and giving the site a mini design overhaul. We also took the opportunity to re-code it as responsive website – I’ll fill you in on the ins and outs of that tomorrow. 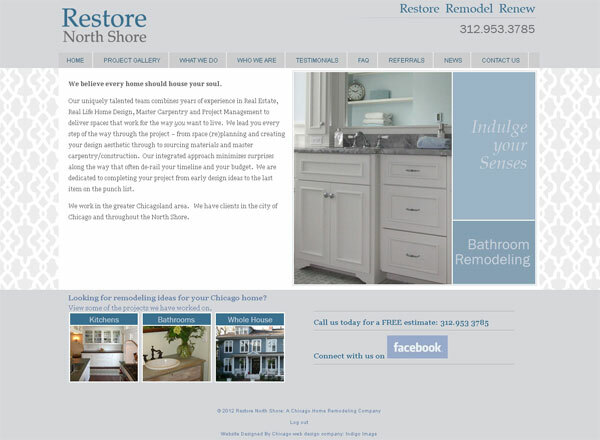 Launched today is a new website for Restore North Shore, a Chicago home remodeling company. We designed and built a custom WordPress template which incorporated not only a blog but pages for project galleries, client testimonials etc. I have been working recently on a number of custom WordPress sites. 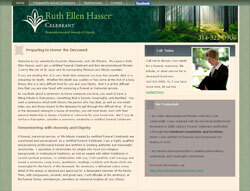 The first is a double project for Ruth Hasser, a St Louis celebrant. Ruth wanted to move her current site over to WordPress so she could take advantage of the content management (CMS) it offers. She also needed a new site for the funeral and memorial side of her business. We have kept the design the same for the wedding side of her business ( she loved it so why change it) but designed a slightly different look for the funeral site, with a more muted color scheme and different imagery. Both sites are in the final phase of production and will be launched shortly. 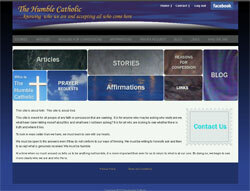 The second custom WordPress site is for a Chicago group, The Humble Catholic. The site is just going through some final testing and client review. I am working with long a long standing client at the moment to convert her website to be powered by the WordPress platform. Her current site is constructed of static HTML pages and a blogger powered blog but the conversion will put everything under one roof and give her much more control of not only her blog posts but the rest of her site too. CMS: WordPress is a powerful content management system and gives you complete control to update the content your website yourself instead of relying on your web designer. Pages: With a self hosted WordPress installation there is no limit to the number of pages you can have on your site, pages can be easily ordered, sorted into menus and even hidden. The look and feel of pages can also be changed by apply a different template to the page. Users: You can set up administrator, editor, author and contributor accounts, which allow different users different levels of access to the site. The main con of using WordPress, for a client, is the learning curve associated with the administrative dashboard. It is definitely more complex than Blogger but we offer comprehensive training on posting, editing and uploading images/files etc. We have just started a new project for a Chicago group, Catholic Joe. The site will act as a portal for catholic guys and includes a blog and forum. Look for it’s launch in the Fall. 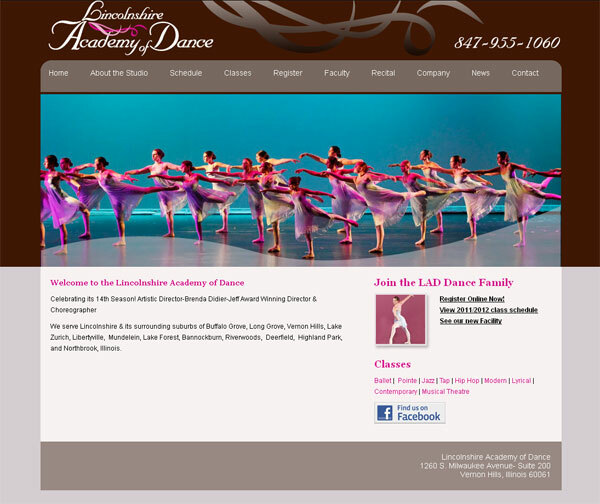 Launched this week is a completely redesigned web site for the Lincolnshire Academy of Dance. The academy is about to move into a fabulous, brand new, custom built space and owner Brenda Didier also wanted to start things fresh with a new web site as well. The site showcases a wealth of professionally taken photographs which capture the commitment of the students and the teaching ethics of the dance school, they taken center stage in the the look and feel of the site. The content from the original site was reorganized into a more logical architecture and a clean and simple navigational tool allows users to easy move around the site. For ease of client management the site has been built on the WordPress platform. We have already heard very positive feedback on the site! 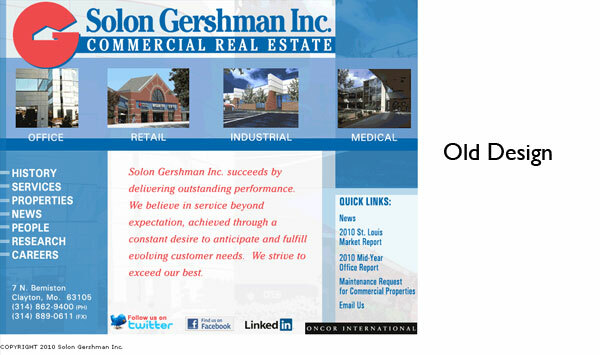 Launched today is a re-designed web site for Solon Gershman Inc, a St Louis commercial real estate company. We completely reworked their old site, creating a fresh new professional look which is easier to use and consistent throughout. 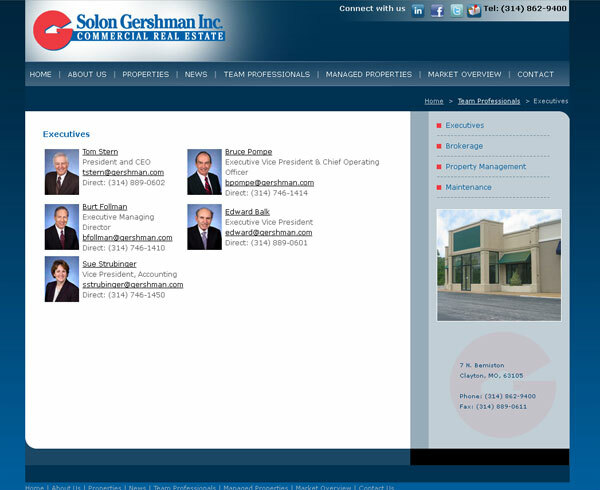 The home page features a slide show of properties with easy access to property search tools and the latest company news. 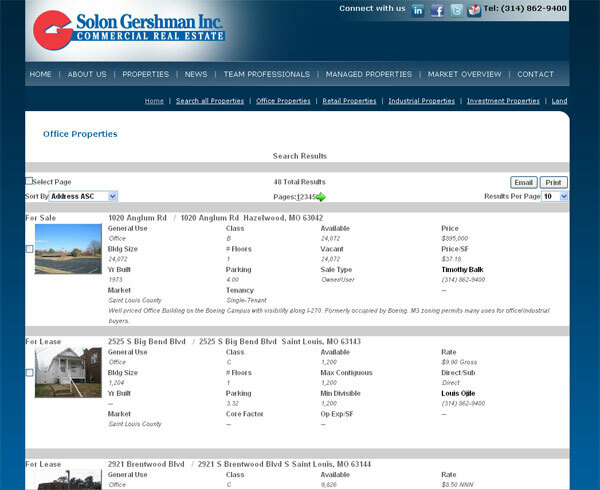 The site integrates data from a 3rd party property listing service and offers the site visitors a seamless experience. 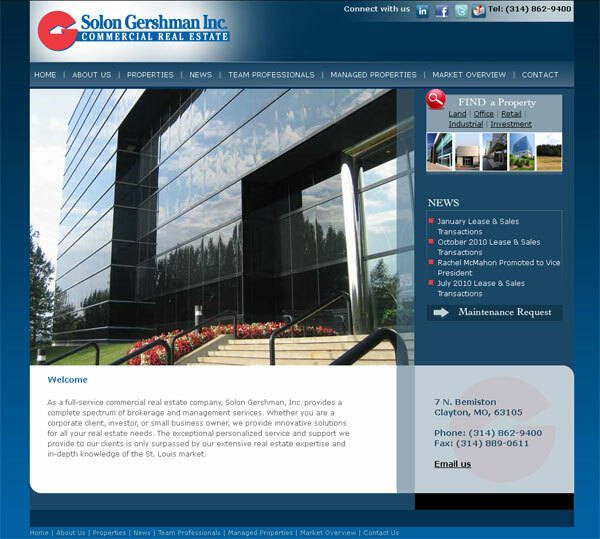 Just in case you were wondering here is what the old site looked like. Kicking off Monday morning with a new project. We are excited to be working on a web site for a Deerfield business, Mind Life and Body. They are launching a live-in fitness (weight loss) retreat called Synergy. The site is due to go live May 1st. 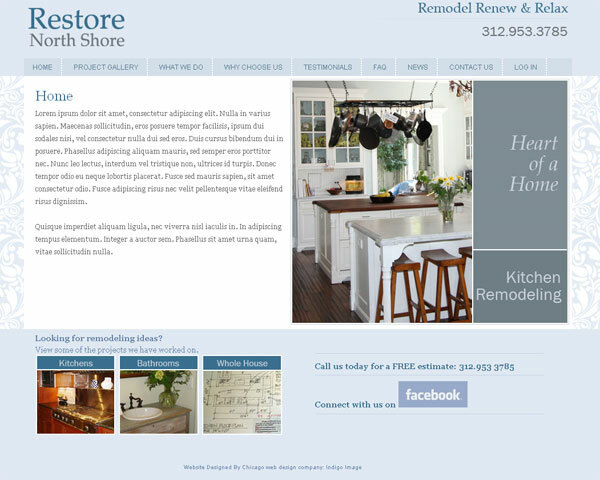 Here is a sneak peak at the new web site I am creating for Restore North Shore, a Chicago home remodeling company. The site is designed around a palette of cool muted colors. This allows the photographs to pop through and take center stage as they really do most of the talking about the capabilities and quality of workmanship the company offers. The site features a simple slide show on the home page and more detailed portfolio sections within.